When asked who the biggest music rights company in the world is today, most people’s minds would immediately leap to Universal – and for good reason. The Sir Lucian Grainge-led major is certainly the largest recorded music company on the planet, while Universal Music Publishing Group is a very strong player in its field (more on publishing shortly). However, in corporate terms, the biggest music company around the globe in 2017 was actually… Sony. That is a fact, in that Sony’s ‘Music’ operations turned over $6.9bn in the year, while Universal Music Group turned over $6.4bn. However, it’s also a fact that relies heavily on a pretty broad stretching of the definition of ‘music’. Universal Music Group was comfortably a bigger company than Sony when it came to recorded music globally last year. As established elsewhere, UMG labels saw their revenues jump $503m last year – with a $581m increase in streaming revenues. Sony’s labels, meanwhile, saw a $206m rise in recorded music sales. 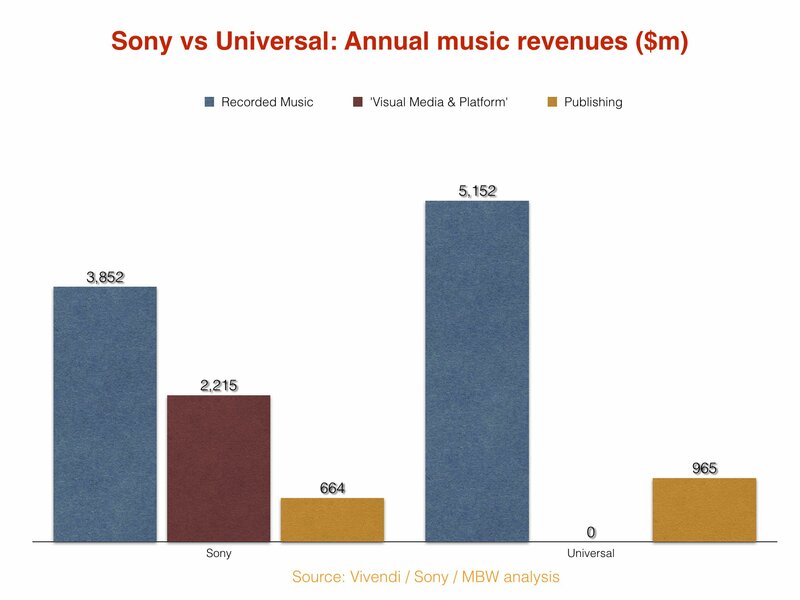 Universal ended up with $5.15bn in total recorded music revenues; Sony’s equivalent figure stood at $3.85bn. Let’s move on to publishing. The way each company reports its performance here is pretty interesting. Universal Music Publishing Group is, as it sounds, UMG’s publishing interest worldwide. Its global revenues reached $965m in 2017, according to MBW’s calculations. Sony Corporation also reports a line for music publishing – but it’s a little more complicated. Sony Corp’s global publishing revenues are measured by taking Sony/ATV’s sales and then adding the results from the corporation’s publishing interest in Japan (Sony Music Publishing Japan). This Sony/ATV figure includes 39.8% of EMI Music Publishing’s net income, representing the equity stake Sony holds in that company. However, it doesn’t include any of EMI Music Publishing’s revenues. When Sony/ATV reports its figures internally, it includes these sales – because Sony/ATV administers the whole of EMI Music Publishing, even though it only owns 39.8% of it. 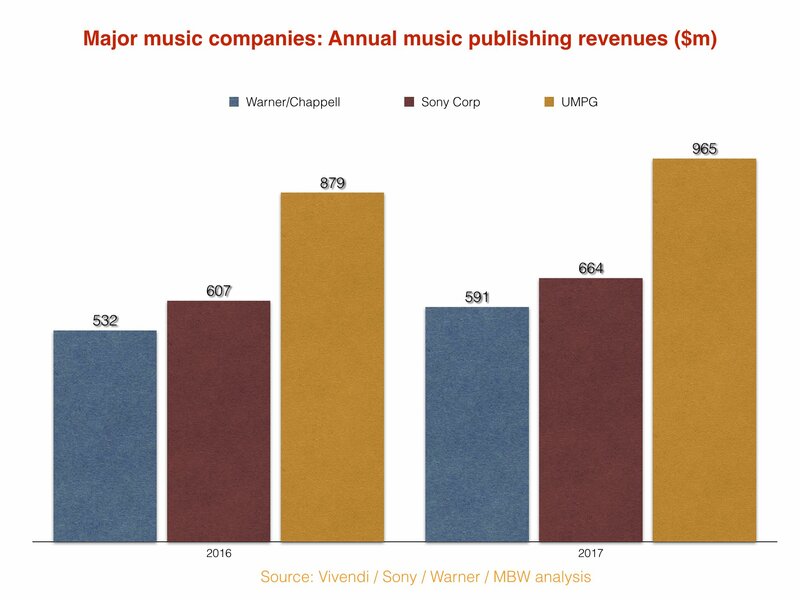 That hopefully explains why, on a corporate reporting level, Universal Music Publishing Group turned over more than Sony’s Music Publishing division last year ($965m vs. $664m). 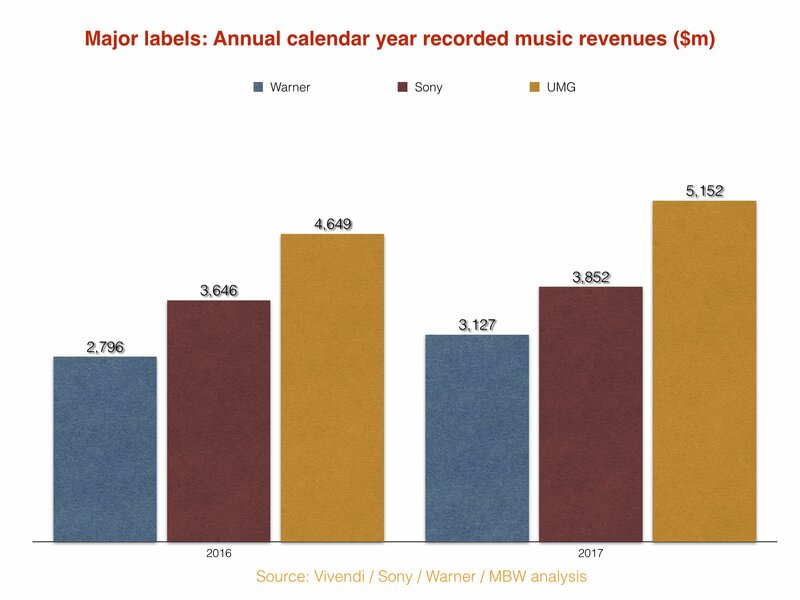 The next question, then, is an obvious one: how could Sony possibly be the biggest music company in the world in 2017 if – in corporate parent terms – Universal boasted the biggest revenue figures for both publishing and recorded music? Because Sony has an extra division within its music numbers – ‘Visual Media & Platform’. And it’s going gangbusters. In the last calendar year, VM&P saw its revenues grow to $2.2bn, up from $1.5bn in the prior year. The key driver for this performance was a mobile video game called Fate/Grand Order, which Sony continually bigs up in its quarterly presentations to shareholders for a “strong performance”. According to Sony Corp, ‘Visual Media & Platform’ should include ‘the production and distribution of animation titles, including game applications based on the animation titles, and various service offerings for music and visual products’. Fate/Grand Order, which is available on both iOS and Android, is – as you’ve probably guessed – an ‘application based on [an] animation title’. Quite what it has to do with music is not exactly clear. Nor is the reason why Sony Corp reports it as part of its broader ‘Music’ activities – rather than its ‘Game & Network Services’ division (aka PlayStation). Where this rather messes things up for an online music industry publication like MBW is when we try to work out the respective performances of the world’s biggest music rights corporations on a profit basis. Take, for example, the graph below. 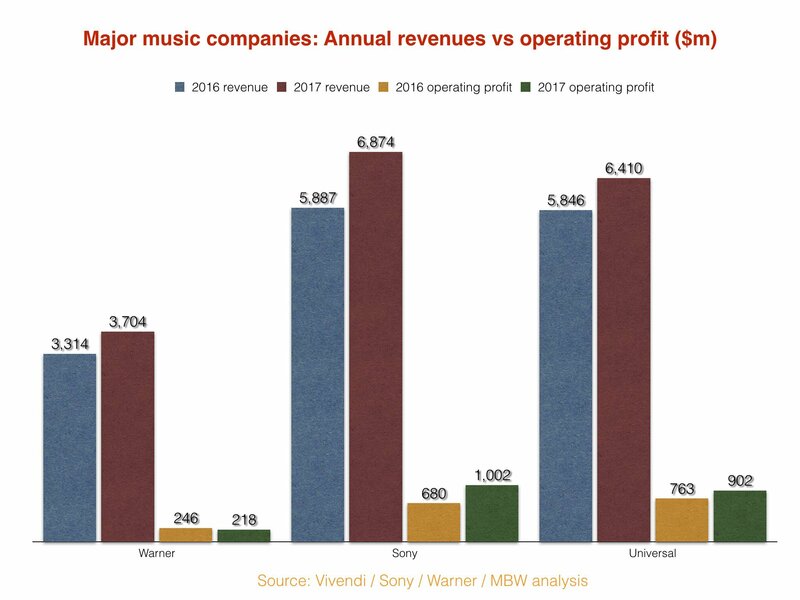 It clearly shows that Sony was the only major music company to post an operating profit in excess of $1bn last year (ahead of Universal by $100m exactly). On this basis, Sony’s Music operation achieved an operating profit margin of 14.6%. Universal achieved a smaller operating profit margin of 14.1%. The problem is, we have no idea how much of Sony’s profit came from a Japanese mobile game – one which seems to have no discernible connection to music (other than having a bit of music in it). So there you have it: Sony was technically the biggest music company, with the biggest profits, in the world last year. But, as we said… it’s a bit of a stretch. * A NOTE ON CURRENCY CONVERSION. MBW has used a currency conversion for both Sony Music Entertainment and Universal Music Group which sees both company’s global revenues – reported by Sony in Japanese Yen and Universal/Vivendi in Euros – reversed into US Dollars. In order to do this for 2017’s figures, we used an average currency exchange rate taken across the 12 months of the calendar year, calculated via Oanda. For Universal, this meant a rate of €1 = $1.13. For Sony, it meant a rate of 1 Yen = $0.0089.